This may come as a shock to you, but I don’t like Autism Speaks. Okay , it really isn’t that shocking. I don’t like Autism Speaks. That’s pretty well known and well documented if you know me. And if you don’t, surprise! Now you do. Why do I have such strong hatred for Autism Speaks? Autism Speaks doesn’t just want to “cure” autism. They want to eradicate it. They want to eradicate US. They think the world would be better off without us. That we are merely burdens. They support ABA therapy, which is problematic. Many people think ABA is a good thing, but it is not. They think stimming is a bad thing, and use words like ‘quiet hands’. Above all, Autism Speaks refuses to see the beauty in autism. They refuse to see that we are more than puzzle pieces. Autism Speaks tells us that we are not worthy. That we would be better off dead. They applaud and lament parents who murder their children because they couldn’t handle the burden… but not a word is spoken of the suffering those children go through. They think that people who are non verbal have nothing to say. They refuse to learn to communicate in other ways, be it sign language, assisted devices, etc. Not able to speak does not mean nothing to say. Far and far away, no. They use tactics like Bleach Enemas. Yes, this is true. No, this is not an urban legend. Autism Speaks hurts. They do not have a single autistic person on their board. They do not speak for us, no, no they do not. They speak in PLACE of us. They speak for what THEY want, not what WE want. And we will not be silent. You are hurting us, Autism Speaks. We are not voiceless like you think we are. Just because we sometimes get our senses overloaded, just because we sometimes don’t understand social cues, doesn’t mean there is anything WRONG with us. We are the way we are. Don’t change us. My name is Nora, and I will loudly and vocally oppose Autism Speaks. Image is one of my favorite pictures of myself, from fall of 2006. I am a female-presenting super pale person. I have long, wavy reddish-brown hair. I am wearing layered shirts in various shades of green, a denim headband, and a pink backpack. 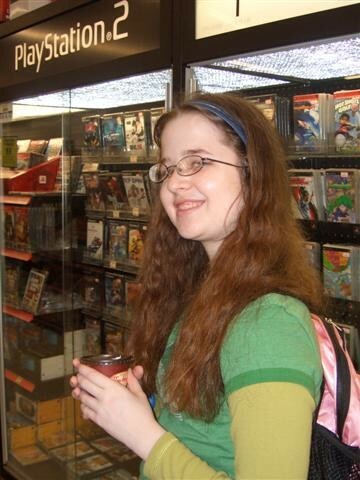 I am holding a cup of coffee in front of a display of Playstation 2 Games.